a, High- strength frame: Further enhanced the back template and moving frame, adopt machine’s body and feet as a whole style, and make the template and machine feet integrated, greatly increased the template’s more stronger and stiffness. b, The machine has being treated with a zinc spraying after the manufacturing works which improves longer service life. c, Adopts opposite directions type tie bar for easily maintenance and wear resistance self-lubricating copper tube which solved original tie bar bushing ‘s problem and improved the lubrication effectiveness. d, Adopt stainless steel plate for the support and back plate each contacting positions, which will reduce the wear and rust of the mold precision. a, Compared to former design T and A type machine, our new E type machine hydraulic system achieves faster operation for 250mm/speed from 180mm/second. b, Hydraulic cylinders for the machine frame movement makes the safety locking of the mold during the steaming process and avoid the leakage of the steam. a, Fang-Yuan patented PID system made by DN50 actuator makes the sensitive steam pressure control between 0.10-0.15Mpa, +/-0.1Mpa tolerance bring us the result for heating time saving around 25%～30% as long as the energy consumption. b, It controls the steam pressure by balance valve and pressure sensor instead of electronic connector pressure gauge. The mold pressure can be set by touched screen to make easy and accurate control. a, For the completely inlet and exit of water, air and steam, we use the big pipeline and valves which is very close to the mold, reduce the waste of energy consumption, while improving running speed. a, Adopting vertical vacuum system, with 4-6” large drain pipeline and long distant of condensation drainpipe, using vertical vacuum system on the top of the machine, equip with a big spraying system, which is spray the rising hot steam directly, greatly increased condensation rate. Thus, improve vacuum suction efficiency and achieve vacuum as main cooling instead of main water cooling (normally water cooling will be set only 8-12s). 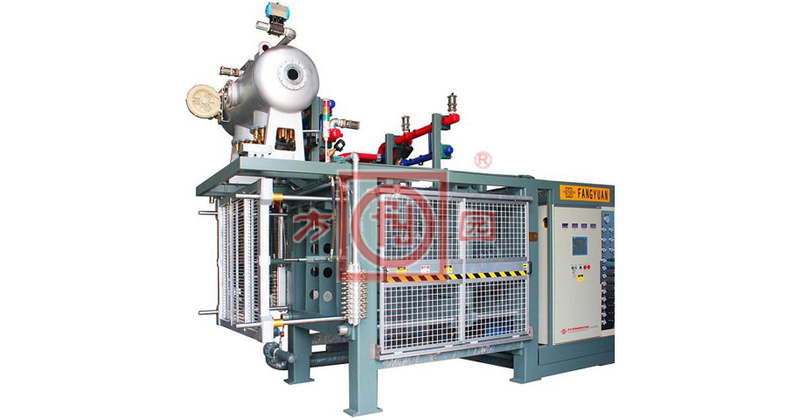 Enable the product of water percentage ≤10%, In addition, the spray header of the replacement and maintenance is very convenient. a, All pressure adjustment are remote controlled by control box, such as cross steaming , Main steaming, Filling pressure, De-molding and air cooling pressure. It is easily operated. In addition, the hydraulic pressure can be also adjusted in touched screen according to different foaming area. The program also has many self-protection and alarm systems. b, Adopting remote control system for all control pressure parts, electric parts, valves, gauges and hydraulic parts adopt famous international brands with high quality to keep stable and smooth running.